Johnny Carson wasn’t the first host of The Tonight Show (he followed originator Steve Allen and Jack Parr) nor the last. 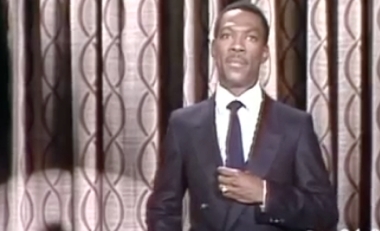 But he was popular and his 30 years as host stand as a record that will probably never be broken. 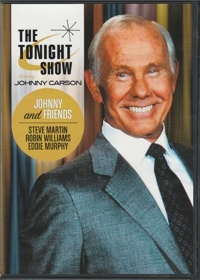 He was accompanied by sidekick announcer Ed McMahon (“He-earrrrrrs Johnny!”), band leader Doc Severinson, substitute band leader Tommy Neusom, and a parade of guests, most of them promoting movies, books, and record albums. There are several installments of “Stump the Band” that aren’t as funny as others, and a completely dead “Might Carson Art Players” sketch that flops. But two segments that Carson does from his desk are very funny, and his opening monologues continue to be a study in stand-up comedy delivery. Williams is the funniest and Murphy holds his own—especially when he shocks TV viewers by proposing to lead the audience in a soul-cleansing shouting of the “n” word. It could have been a drumroll countdown to disaster, but with Carson’s permission Murphy went for it and it made his routine based on race uncomfortably but spot-on funny. The only weak link on this set is Martin, who is surprisingly unfunny. You find yourself wishing they had included another comedian instead. Even Sylvester Stallone and Jimmy Stewart are more amusing, and fans of It’s a Wonderful Life will enjoy hearing Stewart talk about the film. But it is interesting to see film clips from the comedians’ “coming to theaters” movies that we’re now well familiar with. If your family is like mine, they may actually enjoy the commercials as much as the show. It’s fun seeing commercials from 35-40 years ago, and viewers have the option of watching the nine shows with or without original commercials. But remember, this is late-night viewing . . . for “weird families” only.